Capuccino at Sambalatte (this was taken with my iPhone which explains why it’s fuzzy). Brazilian-owned Sambalatte was such a find that even if I stumbled onto it on my second to the last day in Las Vegas, I made sure to visit it twice. It was the best coffee I had during my stay and the best cafe I have ever been to in Vegas with a relaxed but welcoming atmosphere and baristas that know what they are doing. The espressos are short the way they should be (Starbucks pay attention) and the cappuccini (can I say that?) 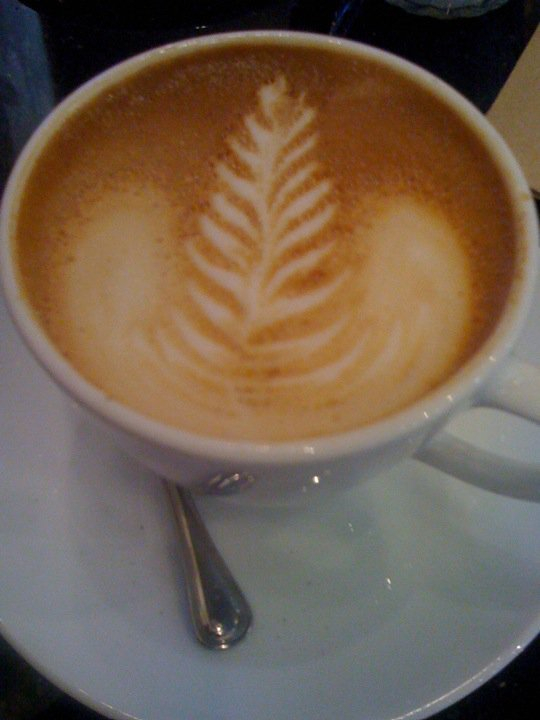 are frothy and decorated with delicious “latte art”. Inside there are several tables, a cozy sofa and even a few shaded outdoor tables. Free WiFi, a table kitted out with rechargeable stations, a selection of breakfast breads and pastries, sandwiches and even gelato. Get there quick before it starts to get mobbed by the coffee cognoscenti. >This kind of coffee looks so great! Thanks for sharing the link to the Sambalatte site!